The Carolina Panthers had been in this position for the past two weeks. 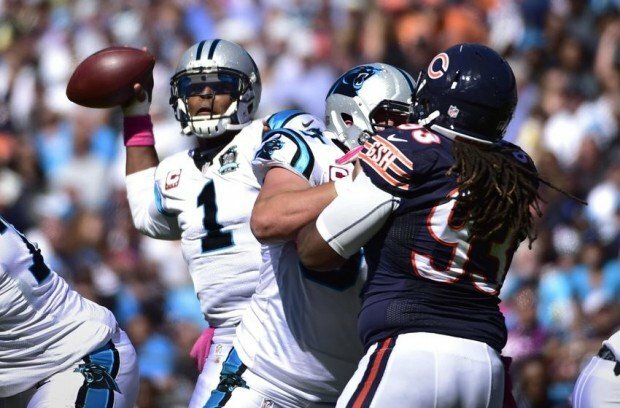 Down by multiple scores early in the game, unable to get anything going offensively or make a stop on defense, it looked as though the Chicago Bears would cruise to victory over the reeling Panthers. And then, the game changed. Chicago kicker Robbie Gould missed a 35-yard field goal that would’ve put the Bears up 24-7 with less than two minutes to go in the first half. Carolina quarterback Cam Newton took advantage on the next drive, hitting five of his six passes for 72 yards in a quick drive that ended with a touchdown pass to tight end Greg Olsen. Carolina was able to carry that momentum into the second half. The offense scored 17 more points and the defense held Chicago to only three more while forcing four turnovers as the Panthers were able to come back and defeat the Bears 31-24 for their first win since Week 2. After the Panthers tied the game at 21, the Bears were able to hit a field goal to go up 24-21 with about two minutes to go in the third quarter. For the majority of the fourth, Carolina’s offense was unable to get anything going. Their defense, however, stepped up. They forced two turnovers on two drives that eventually led to a field goal that tied the game at 24 with about four minutes left. On the next Chicago drive, the Carolina defense did it again. Cornerback Antoine Cason forced a fumble that the Panthers recovered. Newton was able to find Olsen in the end zone once again for a touchdown, and the Panthers defense kept Chicago from scoring again. It was a great game for Olsen, who caught six passes for 72 yards and two touchdowns (including the game-winner) against his former team. What was even better was the fact that his young son, T.J., who had been in and out of the hospital over the past few months with medical problems, was able to attend the game and see his dad win it for Carolina. Carolina certainly turned things around. The defense returned to its normal style of aggressive, disciplined football and were able to force four turnovers (two interceptions, two fumbles) and four sacks. The offense was able to finally find a rhythm, thanks largely in part to Cam Newton’s performance. Although he only completed 19 of his 35 passes and had an interception, most of his incompletions were because of dropped passes. The interception came from a tipped pass. Newton also threw for 255 yards and two touchdowns. The run game rebounded as Carolina rushed 27 times for 90 yards and had one rushing touchdown from Chris Ogbonnoya. On special teams, punt returner Philly Brown made a heads up play for the Panthers, as he was hit before the ball arrived, but scooped it up and returned it 79 yards for a touchdown anyway. For Chicago, it was a tough game. In the first half, everything went their way. Jay Cutler played extremely well and Matt Forte seemed to be back to his old self. The defense was playing well and it looked like the Bears would win easily. In the second half, it was a completely different story. Their defense struggled to stop Carolina and Jay Cutler struggled in general. Matt Forte became non-existent. They kept turning the ball over and allowed Carolina to come back. The Panthers are now 3-2 and are in sole possession of first place in the NFC South. It may not stay that way for long, as their upcoming games are at the Cincinnati Bengals and Green Bay Packers, then a home game against the Seattle Seahawks. The Bears are now 2-3 and are behind the Packers (3-2) and Detroit Lions (3-2) in the NFC North. The Minnesota Vikings are also 2-3. They’ll have a chance to rebound next week at the Atlanta Falcons. They need a win to keep up in that division.